With a portfolio of hundreds of outstanding relationships built on a history of unparalleled food and outstanding service, the Presidential Gourmet kitchen is dedicated to producing food based on a firm environmental philosophy using sustainable methods and products. They are proud to spark imaginations, whet appetites and exceed expectations while making local choices. Their delicious menus and attention to detail have made Presidential Gourmet an industry leader in bespoke events for nearly three decades. 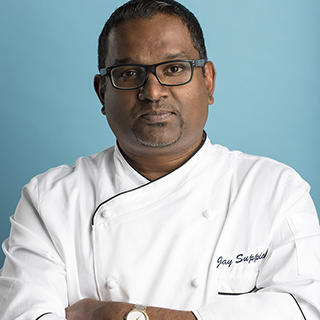 Our new Executive Chef Jay Suppiah, brings a heightened level of innovation and elegance to our new menus. Jay’s international experience, artistry, and outstanding palate provide a new experience in flavours, textures, and visual elevation to each plate which have been garnering rave reviews from clients and industry experts alike. Jay’s highly organized and creative approach results in a culinary experience you truly have to see and taste to believe.